Anniversaries are about celebrating your time together, so celebrate your best memories with photos! Whether you are looking for anniversary gifts for him or her, MailPix got your covered. 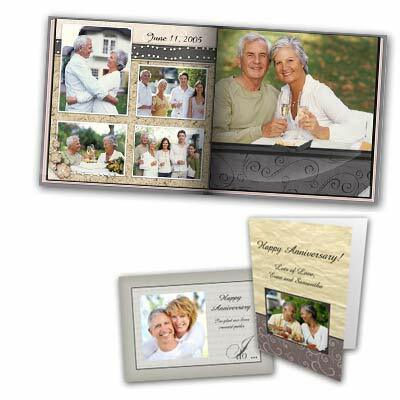 Create a history of your relationship in an Anniversary Photo Book, and be sure to include a matching photo card! We offer many easy to customize templates for you to work with; so create a card for loved one add a photo and text and make it personal. Adding a picture to a gift makes a unique gift that can't be purchased anywhere, and no matter what it will always be appreciated because it was created personally for them. Whether it’s a 10 year anniversary or a 50th anniversary, the possibilities are endless with MailPix. Need ideas for anniversary gifts, check out our selection of gifts!